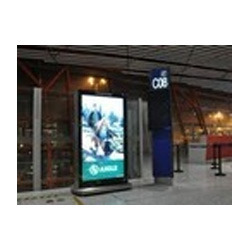 Manufacturer & Exporter of Digital Signage. Our product range also comprises of LED Video Display, LCD Video Wall and LED Display.In these signages, content can be exchanged more easily, animations can be shown and the signs can adapt to the context and audience, even interactively. We are a trusted name in the domain of manufacturing, supplying, trading and exporting finest quality Digital Signage. It is a form of electronic display that shows information, advertising and other messages. Digital signs can be found in public and private environments like retail stores and corporate buildings. In these signages, content can be exchanged more easily, animations can be shown and the signs can adapt to the context and audience, even interactively. Digital content delivery and interactive platforms for retail, BPO etc. Public information for the transport sector, industries etc. Being a customer focused organization; we are engaged in offering a wide assortment of Digital Signages. A trained and qualified team of professionals is hired by us to manufacture the offered range of digital signages. Post production, we thoroughly inspect these signages on certain well-defined parameters of quality to rule out every possibility of defect.